2d Boy are actually two men – Ron Carmel and Kyle Gabler. Together, they’re living the indie dream. You may recognize Kyle as the developer behind the Experimental Gameplay Project and Tower of Goo, the unique physics game that has you building structures out of little goo balls. World of Goo, the company’s first title, takes the basic idea behind Tower of Goo, and expands it into a living, breathing world. Steve Cook got a chance to throw the dynamic duo a few questions about IGF (in which World of Goo is a competitor), the indie life, and how their goo balls are doing1. 1They’re doing pretty goo… d. Good. Get it? I know, I’m sorry. Is “TIGER Sauce” the semi-official name of the site now? Because if it is, I totally approve. There’s a thread dedicated to the Tiger Sauce on the forums. I think Derek could get some ad money from the company that produces the real Tiger Sauce. I miss the joystick, actually. Maybe the two logos could display alternately. 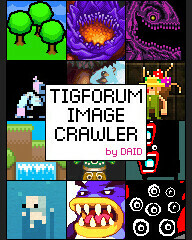 Lol, or .. you could hold a contest in which the aim is to mix a tiger pixel art drawing with the joystick logo to create something totally fresh? I dunno, but I like the ‘TigerSauce’ banner a lot. I wish I’d kept a copy of the original banner on my computer. I have this one ’cause I thought it’d only be up for a little! The Best Sauce. The Only Sauce. Back on topic: Great interview, would love to see more like it. 2D Boy will rock the house in feb!